How can I get the best battery life for my A10? Is it best to keep it connected to the charger as often as possible or should I allow it to discharge naturally once it is completely charged? The best way to keep the battery life is to disconnect the charger once the ARCHOS 10 is fully charged. Out of the box, it is best to do at least three full charge/discharge cycles. Avoid using the ARCHOS 10 as a desktop computer, meaning, connected with the charger all the time. When I try to watch a movie, Windows Media Player ask me to go on a webpage to download software components. What is it about ? Do I have to do it? Yes. Microsoft Windows Media Player needs a secrity update to play protected files. You can install this component by clicking on this link to Microsoft's security compenents web page. Why does my hard drive show less than 160GB when I look at its properties? How can I install a printer on the ARCHOS 10? I think the computer has a virus. What should I do? One of the advantages of the ARCHOS is that it comes with the anti-virus software Bit Defender. Close all other programs and run Bit Defender. You will need the installation code that came on a card in the box. Read the instructions carefully once it starts running in order to get the best results. Where is the User Manual? How can I read it? The ARCHOS 10 user manual is available as an electronic file in PDF format which is found on the desktop. You will need the Adobe Reader program to view it. You can go to www.adobe.com to download this program or you can double click on the User Manual icon and select to use the web service (you must have an Internet connection) to find the Adobe Reader program. Can I change the internal Hard Drive of my ARCHOS 10? I got a CD with the ARCHOS 10. What is it for? How can I use it? It contains drivers or special software for your PC. Usually, you will not need this since your computer is pre-configured in the factory. It is for advanced users to re-install the original drivers if they have attempted to replace them with other ones. You'll need a standard external USB CD-ROM reader to use the CD. Blue icons appear on certain keys of the keyboard. What are they for? 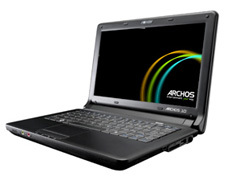 These are special keys that give you quick and easy access to several useful functions of the ARCHOS. Hold down the blue Fn key on the bottom left and then, without letting off, press on the desired blue special function. Check the full manual for more information. Briefly, the functions are as follows. F3 Turn on/off the WiFi. Helpful to save battery energy. F4 Switch display to an external monitor. I’m having problems using Skype, where can I get help? See the complete help section at the Skype website. Where can I get help for using XnView? Press the F1 ‘Help’ key while running the program or see the help section at the XnView website. Click on the ‘Skype’ link on the desktop, where you will be directed to a web page to download the ‘Skype’ program. Your ARCHOS will need to be connected to the Internet either by WiFi or a wired Ethernet connection. Once it is installed, read the on-screen instructions carefully to create an account. I cannot set the different options of the parental code. It asks me for a password. What is it? The default password is “Admin”. If you have changed it to a personal password and have forgotten it, check the FAQ of the Parental Filter web site www.parentalfilter.com. Where do I find Microsoft Word and Excel? These are programs from Microsoft that are not automatically included with Windows XP. They must be purchased. The ARCHOS 10 does have a freely available suite of programs called Symphony from IBM that can read the Microsoft files as well as save in the same format so that people using the Microsoft Office suite can open and edit your documents as well. Symphony Documents is the equivalent of Microsoft Word, Symphony Spreadsheets is the equivalent of Excel, and Symphony Present is equivalent to Power Point. I try to run the program IBM Lotus Symphony or Vtuner but it keeps trying to connect to the Internet instead. How do I run these programs? These programs must be downloaded so that you get the very latest version. Your ARCHOS will need to be connected to the Internet either by WiFi or a wired Ethernet connection. I tried installing the Parental Filter software but it asks for a code. Where do I get it? A code is given on a card in the box. Carefully enter this code. Many broadcast FM radio stations also broadcast over the Internet but some do not. This may be your case. In the near future, if you find a web radio station that is not listed in the vTuner program, you can go to an ARCHOS web page and submit it for inclusion. I cannot configure the webcam for Skype (or another program), it says there is no webcam. The webcam must be activated from the keyboard function keys. Hold down the blue Fn key on the bottom left and then, without letting off, press the F12 key. A green light next to the webcam will turn on indicating that it has been activated and is ready to use. Now continue installing the Skype software. How can I edit the photos that I have copied to the ARCHOS so that I can add effects or take out the red from people’s eyes? Start the graphics program called XnView and then open up the photo from that program. In it you have many options for fixing your photos, including cropping and red-eye removal. I tried installing BitDefender antivirus but it asks for a code. Where do I get it? When I turn on the ARCHOS, Windows is always giving me a message “Wireless network connection is not connected – Wireless network unavailable”. This is normal. To save energy, the ARCHOS always starts up with the WiFi set to off. You must manually use the Fn-F3 keys if you want to activate the WiFi connection. I cannot connect to the Internet over WiFi, what’s wrong? Make sure that your WiFi is activated. This can be turned on and off with the blue function key pressed down and then the F3 key. The blue WiFi indicator just below the touch-pad will light indicating that it has been turned on. It could be that the WiFi modem/router is hiding its SSID. This is done for security purposes sometimes. You can either change this on the WiFi modem/router (see its instructions) so that it broadcasts its SSID (and then you’ll see it in the list on your ARCHOS 10) or you can go into the advanced settings of the Wireless Network Connection screen to the Wireless Networks tab and ‘add’ a new connection. You will need to know the SSID name and its other connection parameters. My WiFi indicator is on (lighted blue icon below the touch-pad) but I still cannot connect to my WiFi hot spot. Right click on the wireless icon the system tray (bottom right of screen in Windows) to view the Wireless Network Connection window. Click on refresh network list. Choose to connect to one of the listed WiFi spots. Make sure you carefully enter the security password (WEP, WPA, WPA2) requested. This password has been set up by the person who set up the WiFi router/modem. Your WiFi router/modem may need to be “paired” by pressing a special pairing button on the modem or router. Check your WiFi or Modem’s instructions. I am having problems with my Ubuntu version of the ARCHOS 10. Please use the ARCHOS e-mail webform in the ARCHOS account that you created when you registered your device. I tried to install another operating system and it wiped out the entire hard drive. I do not have the recovery partition any more. When I press F9 at boot, it says "no recovery found." How can I get it back? Trying to install an operating system other than Windows XP installed by Archos deletes all data on the device including the backup partition needed for an F9 recovery. The loss of data and the recovery partition cannot be recreated. On the bottom of your device, there is a license number sticker from Microsoft that is attributed to your ARCHOS 10. Using an official Microsoft Windows XP Home Edition CD, you can connect a USB CD or DVD drive to ARCHOS 10 and install Windows XP using the license number on the sticker. Verify that there is nothing connected to the USB ports of the ARCHOS 10. It may be trying to boot up from an external hard drive or USB stick. When I press the power button, the ARCHOS 10 does not start up. You must hold it down until you see the blue ‘on’ light turn on below the touchpad. If it still does not start, plug it into a wall outlet using the included transformer and allow it to charge for at least a half hour before trying to start it up. I have downloaded some videos from the Internet but the ARCHOS cannot play them. What can I do? The best thing to do is to update your Windows Media Player to version 11. Go to the download area at Microsoft’s website www.microsoft.com to download the latest free version. If this does not solve your problem, you may need to download special Codecs (COmpression/DECompression) which will allow you to play different formats of videos. The freely downloadable codec from DivX (www.divx.com) will allow you to play videos that are coded in this format. Make sure you have also downloaded and installed the latest Flash™ plug-in from Adobe systems (www.adobe.com). The media card I put into the card reader is not recognized. I cannot see it. Due to the large number of different cards from different manufacturers, it can happen that not every card will be readable. If you have a number of cards that are not readable in the ARCHOS but are readable in other computers, contact ARCHOS technical Support. I cannot find the web camera in “My Computer” anymore or the program I am running says there is no web cam. How can I get it to work? To activate and deactivate the web camera press and hold the blue Fn key and then press F12. The ARCHOS 10 is frozen or stuck. I cannot use the mouse or keys. What can I do? If the Windows operating system freezes, you can either restart the machine or stop the program that is causing it to freeze. Press the keys CTRL, ALT, and DEL all at the same time which will make the task manager appear. You can select the Applications tab and choose to end the program that is not responding. Or you can choose the menu item “Shutdown”. If the Task Manager does not appear when you press CTRL-ALT-DEL, then shut off the ARCHOS 10 by holding down on the power button until the ARCHOS shuts off. Windows does not start properly or starts incorrectly. Can I reset the computer to how it was when I first bought it? Yes, you can! This Recovery option however is a last resort as this will erase all the files you have saved on your ARCHOS. If Windows does not start correctly, you can start it in ‘safe mode’ by pressing the F8 key when starting up. This reduced functionality mode may allow you to fix your problem in Windows without having to do a complete system Recovery. To completely recover the system, which brings your ARCHOS 10 back to the factory condition (all your personal files erased), press and hold the F9 key when starting up the ARCHOS 10 and follow the on-screen instructions.